ORGANISERS of the Acht na Gaeilge demonstration held in Belfast on Saturday 11 October welcomed the huge turnout of people from across the country who made the march a vibrant and colourful event. As many as 4,000 people marched from assembly points in North, South, East and West Belfast in support of the demand by Irish speakers for the enactment of the Irish Language Act, agreed at the St Andrews talks in 2006. Pupils from naiscoileanna and bunscoileanna took part in the march, making it such a youthful and upbeat event while groups of pupils from the North’s Third Level Irish colleges also took part. Despite signing up to the agreement at St Andrews the DUP, under both its Culture ministers Edwin Poots and the present incumbent Gregory Campbell have refused to put legislation before the North’s Executive that would recognise the rights of Irish speakers in law. The last census revealed that upwards of 75,000 people across the North speak, read and write Irish while at least a further 167,000 have some knowledge of the language. Saturday’s demonstration saw Gaeilgeoirí from across Ireland gather at various meeting points throughout Belfast before parading to Bank Square. From there the crowd marched through the city centre to the BBC’s Headquarters at Ormeau Avenue. Irish speakers have long complained about the British Broadcaster’s failure to support and promote Irish language programming. The BBC in the Six Counties, in the year 2003 to 2004, spent £662,000 on Irish language broadcasting compared to BBC Wales £29.3million spending. “Gregory Campbell as Culture Minister should be long-sighted on this matter. He is in a position to show leadership to his party. The Irish language threatens no one. It is not compulsory. 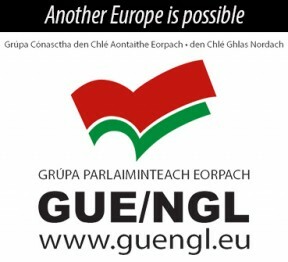 Irish language rights threaten no one. 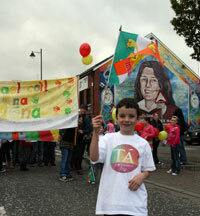 “The revival of the Irish language has been a cultural success story. More and more people are using Irish. Young children in particular are being educated in increasing numbers through the medium of Irish and it is their future and their rights that must be secured through legislation. “It is unfortunate that the Minister’s stance has been so negative and this is certainly not in the spirit of a partnership in the Executive or the Assembly. “It is with regret that unionists have used this question as a political football rather than an administrative issue.